There’s nothing wrong about being prepared for emergencies. Like it or not, the unexpected can happen at any time. But you won’t be as stressed if you know you have food on hand for the crisis. What kind of emergency food is best? The best emergency food kits have calorie-packed goodness that won’t take long to prepare. You might prefer ready-to-eat rations over freeze-dried meals if you’re worried about water consumption. Or perhaps you prefer food bars as the simplest solution. In any case, it’s not just the flavor that matters. Take into consideration how much you need as well as how you plan to store and transport it. Campers and hikers know that Mountain House makes tasty freeze-dried food. Their 14-day supply includes three daily meal pouches for one person with a total of 1800 calories per day. Each two-week kit comes with 42 pouches that will consume about 72.25 cups of water to prepare. And each 12.9-pound kit is boxed to fit in a 2-foot x 2-foot x 8-inch space. Just as important, Mountain House offers a 30-year Taste Guarantee. They’re probably good for it since they’ve already been in business for half a century. If you want to work on your three-day kit, include the Mountain House Just in Case Bucket. It comprises twelve meals to feed a person for three and a half days. There are classic meals like Beef Stew and Granola with Milk and Blueberries just waiting for you to taste them. NorthWest Fork’s month-long food supply stands out for being kosher, vegan, and non-GMO. This Oregon-based company includes fifteen servings of six meals. And each freeze-dried meal becomes a pint of food once you add hot water. The kit stays good for ten years just in case you don’t need it right away. But you might want to test it out ahead of time. You’ll find favorites like tropical trio oatmeal, pinto bean stew, and green pea soup. Valley Food Storage packages their freeze-dried meals in 5-serving packs, not individual ones. This is advantageous if you plan to feed several people at once. But it may create a problem if you have to store a partially-used pack. Fortunately, each package is resealable. Each unopened meal has a 25-year shelf life. And all each one needs is boiling water to become breakfast, lunch, or dinner. Legacy Premium Food Storage offers 18 pounds of food packed in Mylar pouches sealed in a bucket. Unopened, it should last 25 years. Each pouch holds four servings of GMO-free meals for breakfast, lunch, and dinner. Peak Refuel sells both individual and multi-packs of their freeze-dried meals. Their main benefit is that they usually require less water to rehydrate than competitors’ foods. They also contain real meat, not fillers, and a hefty dose of protein. Western Frontier bypasses the need for rehydrating food by offering real military-surplus MREs. These meals-ready-to-eat are what American troops use in the field. They stay good for years under adverse storage conditions. And they never need heating or water to be edible in an instant. 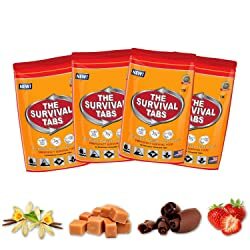 Minimalists will appreciate the emergency rations from Survival Tabs. They are rich with fifteen essential vitamins and surprisingly delicious for what they are. Moreover, they are one of the ultimate problem-solvers because they are compact and easily divided into smaller portions. One package of 96 tabs lasts one person for eight days of survival in crisis conditions. Each serving consists of 12 chewable blocks of 20 calories each. They come in flavors like vanilla, chocolate, butterscotch, and strawberry. And each pouch only weighs 10 ounces. They will store on the shelf for at least 25 years. The Datrex food bar is another excellent option if you plan to keep your rations as compact as possible. They will store for up to five years, too. Each bar contains 200 calories and tastes similar to coconut. The texture is crumbly, not hard to bite or chew. Furthermore, they won’t make you thirsty. Datrex also sells another essential item for your emergency food supply. These are 125ml (4.23-ounce) bags of purified water that can withstand freezing without rupturing. These are rations that you might find on a Coast Guard ship. SOS Food Labs presents a 1.6-pound package with nine food bars. Each individually-wrapped bar replaces one meal. And the entire package represents three-days of survival rations. You can choose from coconut, cinnamon, or a mix of the two flavors. Each bar has 410 calories, and each package will store for up to 5 years. Grizzly Gear is also in the business of emergency food kits. Their three-day supply is comprised of lemon and vanilla-flavored bars that are full of vitamins. Each of the 9 bars contains 400 calories. Additionally, each one is Kosher. The S.O.S Rations kit is a no-brainer choice if you can’t decide between the other options above. It has food, water, and a survival tips guide to boot. There are US Coast Guard—approved food ration packs, water bags, plus Millenium energy bars. Everything stores for five years on the shelf regardless of the weather conditions. Augason Farms sells a 72-hour kit with food for four people. It provides about 2200 calories per day per person. Also, it has a 20-year shelf life. There are sixteen pouches and seven freeze-dried food types. They are packed so that there are multiple servings in each pouch. Instead of fussing with heating and hydrating meals, energy bars are straightforward calories to keep you going at crunch time. They come in a variety of fruity flavors that won’t make you crave extra water. And they store for five years. Each individually-wrapped bar offers about 400 calories made up of 8 grams of protein, 53 grams of carbs, as well as fat, sodium, and fiber. They even come with an emergency guide to help you manage in an urgent situation. The best kind of emergency food depends on a few factors. For example, if you’re planning on a short-term crisis like a weekend without power, you might prefer MREs or bar rations. They won’t require hot water if you don’t have a gas stove or campfire. Plus, you can probably handle the flavor (or lack thereof) for a day or two. On the other hand, freeze-dried meals are tremendous if you don’t need to worry about your water supply and have a method to boil it. The variety and presentation are appealing compared to energy bars. Also ponder on how you plan to transport and store the food. After all, you might decide to stock up on both freeze-dried and emergency rations to cover all the bases. They go on to explain that you may have some foods that will serve this purpose right now. To illustrate, canned vegetables, dried fruit, and dry cereals are all useful. So are peanut butter, canned juices, and canned milk. In summary, plan for about 2000 calories a day for each adult in your home. And be sure to rotate your stock to keep food from expiring. Manufacturers may tout a 5-year or 25-year shelf life, but often that’s under optimal conditions. If you want to recreate those conditions in your home, try these tips. First, choose a space that doesn’t get direct sunlight or suffer rapid changes in temperature. But good ventilation is important, and so is low humidity. If you can’t meet these requirements (like if you have rations stocked in your car), then select food that can endure worse treatment (like survival ration bars). Next, prevent pests from having access to your food. Keep everything sealed until you need to use it. You can also protect it with diatomaceous earth that is safe for humans but kills creepy crawlies. And some survivalists go a step further. They say to hide your cache and not speak of it to anyone outside the family. That way if the SHTF, you won’t draw as much unwanted attention. Freeze-dried meals require water to become properly edible. That’s why it’s smart to prepare water storage too. The US government recommends having one gallon per person per day for at least three days. This should cover drinking and boiling for meals. Of course, this quantity might not be enough if it’s hot weather. It’s best to store clean chlorinated water in food-grade containers and rotate it every six months. If you purchase commercially-packed water, it has a longer shelf life. Have you ever had unsalted food? Or oatmeal without any fruit or sugar or syrup? Spices and condiments are something a lot of people don’t include in their kits. But not only can a little salt and pepper save a meal, it can also serve as currency if you need to trade for something else. We hope you found the best emergency food kit today. And that’s the key operating word—”today”. Don’t delay preparing for what may come. You’ll never be sorry you had food on hand when things get dicey.